When we think if Mary as the Sorrowful Mother, we’re likely to focus on her grief during the Passion and Crucifixion of Jesus. Indeed, Mary suffered agony along with her Son in what is known as a spiritual martyrdom. She may not have suffered in body as Jesus did, but she suffered mentally, emotionally, and spiritually as he was mocked, falsely accused, beaten, crowned with thorns, scourged, forced to carry an unmanageably heavy cross up the hill to Golgotha, stripped naked, and nailed to the cross. She stood at the foot of the Cross as our Lord struggled in agonizing pain for each small breath. And when his last breath came and went, she held his tortured, mangled Body in her arms. We can’t undo the sorrows Mary withstood, but we can ease them. We can do so by offering that Sorrowful Heart our love and devotion today especially, but always as well. Simeon’s prophecy in the Temple included the astounding revelation that not only would Jesus suffer greatly, but Mary would, too. A sword would pierce her heart, Simeon said. The Church recognizes that it wasn’t just one sword, but seven. That’s why we often see the Sorrowful Mother depicted with seven swords piercing her Immaculate Heart. Sometimes, she is represented by a winged heart pierced by seven swords. 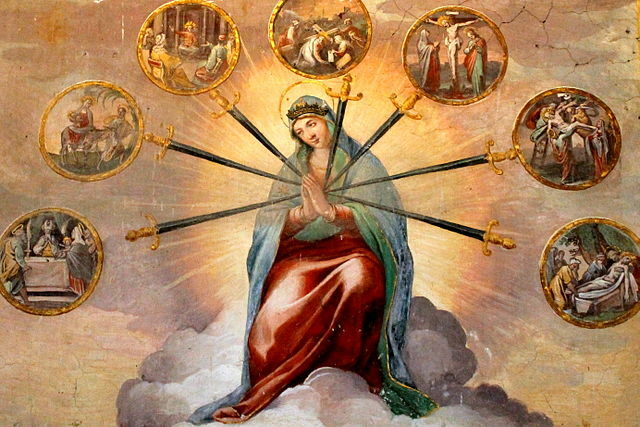 In memorial of the feast of Our Lady of Sorrows, perhaps we can dare to accept with love the swords that pierce our own hearts, offering our suffering in retribution for the sins of this world. Perhaps, we can offer seven special sacrifices or acts of love to our Sorrowful Mother in honor of her Seven Dolors. There are so many hurting people out there. I’m sure you know at least seven of them. Take a moment today to reach out to seven who suffer with a phone call, greeting card, text message, or even a personal visit. Your efforts could do much to alleviate their sorrow. There is a beautiful Catholic custom of praying the Chaplet of the Seven Sorrows of Mary. It’s easy to do, and takes about the same amount of time as saying the Rosary. For instructions on how to pray the chaplet, click here. You also could make a living chaplet by stopping for seven minutes, seven hours n a row to say one decade of the chaplet or to contemplate one of our Lady’s sorrows. Or, simply resolve to tell your Mother Mary that you love her seven times throughout your day. Your seven times Sorrowful Mother loves you so very much. How wonderful it would be for you to demonstrate your love for her in return. I’ve written about the Memorial of Our Lady of Sorrows and Mary’s Seven Sorrows for National Catholic Register. Click here to read more. Blessed Virgin Mary, Catholic Church, Liturgical Year, spirituality. Bookmark. Happy Birthday, Dear Mother Mary!